Born: 1825, Seaford, Sussex, England. Died: 8 November 1897, Knysna, South Africa. 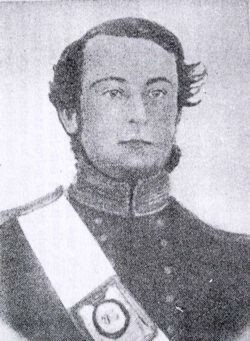 Christopher Harison, forest officer, entered the Perthshire Regiment (later the Second Battalion of the Royal Highlanders) in March 1847 as an ensign, came to the Cape Colony in 1849, and fought in the Eighth Frontier War (1850-1853). He attained the rank of captain. Back in England he married Louise Marie Millett Moorman, with whom he eventually had a son and two daughters. They came to the Cape and tried farming and horse breeding near Cape Agulhas, but without success. In June 1856 Harison entered the forest service of the colony and by 1863 was conservator for the Uitenhage region (which extended from the Tsitsikamma forest as far east as Alexandria), though he resided at Witte Els Bosch (later Witelsbos), a forest station about half-way between Jeffries Bay and Humansdorp. By intelligent observation and a study of forest literature he acquired a knowledge of forest management and silviculture in a time when neither forest rangers nor the dignitaries appointed as "conservators" had any training in forestry, and which eventually qualified him for appointment to a senior position. On 1 January 1874 he was appointed conservator of forests at Knysna for the region from George to Humansdorp (later the Midlands Conservancy), becoming the first senior forest officer in southern Africa. His appointment formed part of the first serious efforts by the government of the colony to manage the hitherto uncontrolled exploitation of the natural forests and was soon followed by the appointment of J. Storr Lister* as superintendent of plantations on the Cape Flats. Harrison remained at Knysna for the next fourteen years. In 1875, with funds provided by the government, he undertook a small experiment in afforestation on a plot granted by the Knysna Municipality - one of the first attempts of its kind since the efforts of W.A. van der Stel* in 1700. On 1 September 1888 Harison was appointed conservator of forests of the Western Conservancy, stationed at Tokai, succeeding J. Storr Lister. He held this post until his retirement in 1892. A giant yellow-wood tree Podocarpus falcatus in the Tsitsikamma Nature Reserve was named the Captain Christopher Harison tree in his honour. Cape of Good Hope. Civil service list, 1885, 1886, 1887, 1888, 1890. Cape of Good Hope. Report of the Conservators of Forests (title varies), 1863-1883; and Report of the Superintendent of Woods and Forests, 1884-1890. Keet, J.D.M. Historical review of the development of forestry in South Africa, c. 1972. Electronic copy received from Forestry Scientific/Technical Services, Knysna. National Automated Archival Information Retrieval System (NAAIRS). http://www.national.archives.gov.za/naairs.htm Documents relating to Harison, Christopher.